﻿ Outdoor bench and stool cushions. WE can get you cushions to suit any garden bench seating, even if it’s an unusual custom shape. We recommend “bench” foam inners for most outdoor benches, a nylon liner is a worthwhile addition if the cushions are likely to be left out in bad weather. Any of our range of water repellant fabrics, are suitable for bench seating. Horace, being so ginger, got really bad sunburn when he was on the “outdoor sofas & chairs” page. I’ve had to take over - I’m that sort of beige blonde that takes a tan. 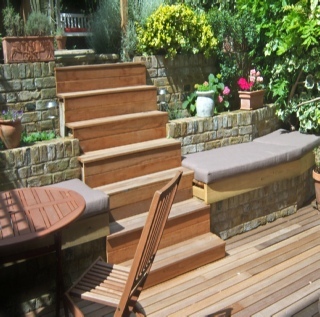 Cushionzone can get you cushions to suit any garden bench seating, even if it’s an unusual custom shape. Pictures of our work, below, all sent in by customers. Horace’s sunburn is still troubling him, but he’s soldiering on.